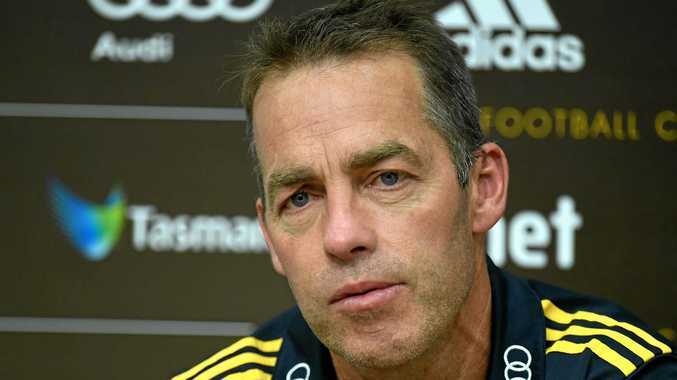 HAWTHORN coach Alastair Clarkson has sparked speculation he is nearing the end of his coaching career at Waverley Park. His side fell narrowly to Sydney on Friday night at the MCG, with the visitors kicking five of the last six goals to run out winners. Sydney rookie Ben Ronke kicked his side's five five goals, then sealed the 12.7 (70 to 11.11 (71) victory with his seventh in the final minutes. Speaking with 3AW on Saturday morning, the four-time premiership coach made surprisingly frank comments regarding his own future at the Hawks. "When you have a game like last night, you get pretty disappointed with your own coaching," Clarkson said. "You just wonder whether or not at some point in time this group of players is going to be better served with a different coach. "I want to make sure that we use the next two years to work out whether it's the best thing for the football club that I'm the bloke that continues to take charge." Clarkson is currently contracted until the end of the 2019 season. Both he and Hawthorn president Jeff Kennett have said they are happy to discuss a new deal for Clarkson at the end of the year. "He's got to earn his right," Kennett told reporters on Monday. "We've come to an agreement earlier on that he and the board will discuss [an extension] at the end of the year and we'll make a decision in our mutual interest. "Until then we're not going to worry. We're focused on just doing the best we can week by week, game by game." Clarkson has coached the Hawks since the start of the 2005 season, winning four premierships.